Today we have a fantastic review from Sandor for their Brother MFC-J480dw CISS. I installed the CISS a week ago. I was impressed by the quality - it is far above average. The installation process is straightforward. After installing cartridges, only the black one was not recognised so had to remove it and shake a bit. It solved the issue. Print quality is very good. Buying original cartridges would have cost me €10 more and wouldn't last long (and I am not printing often). 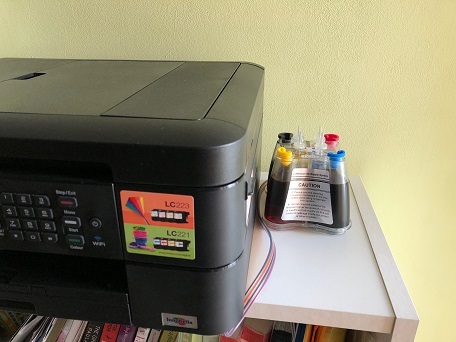 The inks have no smell so keeping printer in bedroom or living room seems to be safe. I also did not have to make any adjustments to the door that hides the cartridges as I managed to fit the tubes in the gap available at the bottom of the door. I was concerned if it would cause kinking but after a couple of days it looked very good. Happy so far! Thanks a lot!